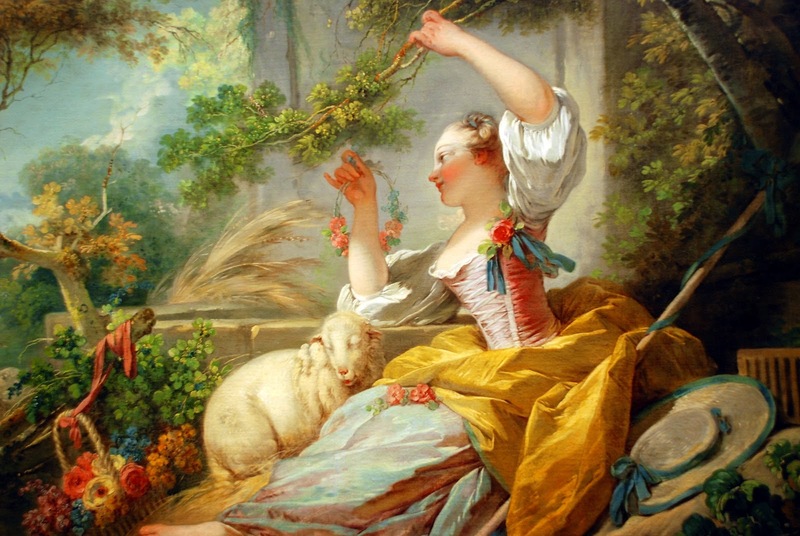 Jean-Honoré Fragonard, (born April 5, 1732, Grasse, France-died August 22, 1806, Paris), French Rococo painter whose most familiar works, such as The Swing (1767), are characterized by delicate hedonism. 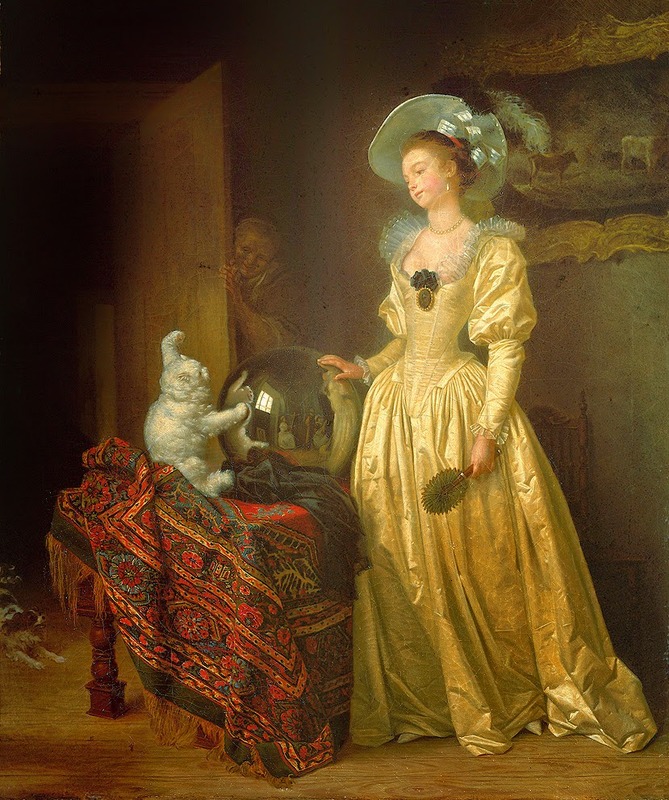 Fragonard was the son of a haberdasher’s assistant. 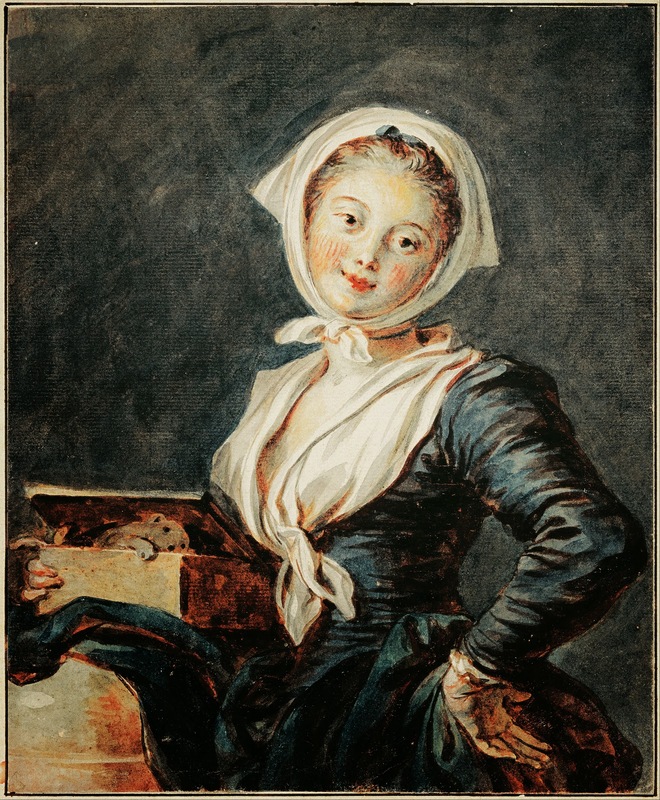 The family moved to Paris about 1738, and in 1747 the boy was apprenticed to a lawyer, who, noticing his appetite for drawing, suggested that he be taught painting. 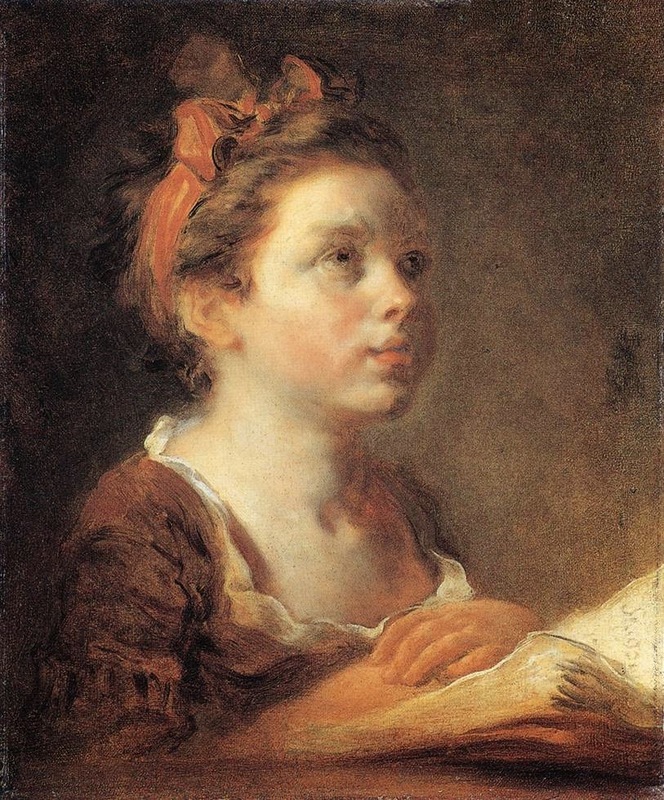 François Boucher was prevailed upon to accept him as a pupil (c. 1748), and in 1752, Fragonard’s elementary training completed, Boucher recommended that he compete for a Prix de Rome scholarship, which meant study under the court painter to Louis XV, Carle Van Loo, in Paris. 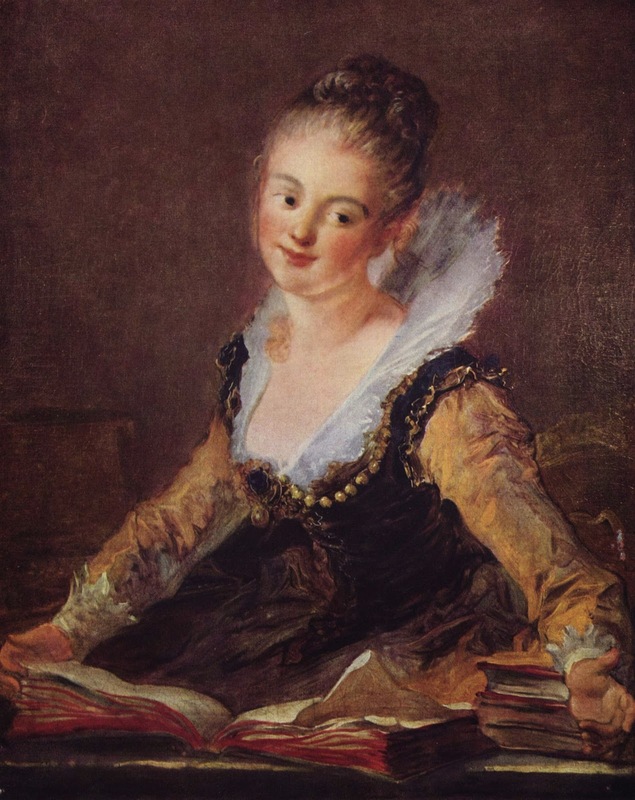 On September 17, 1756, Fragonard set off with other scholarship winners for the French Academy at Rome. 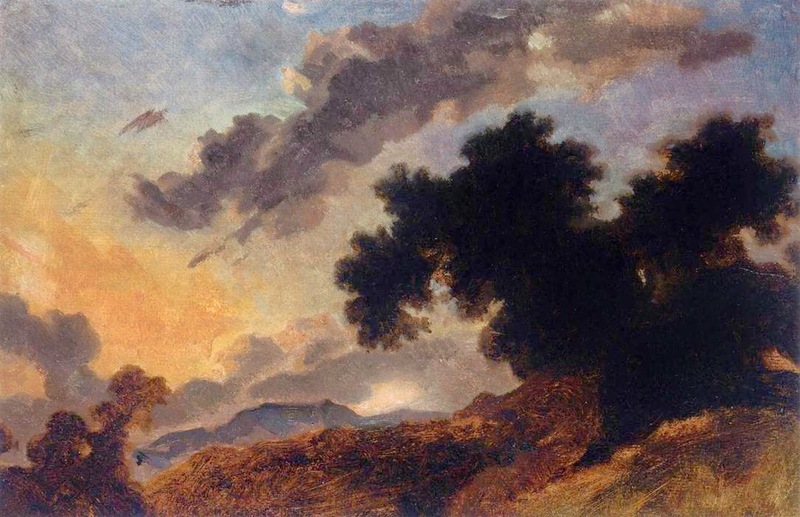 At the academy Fragonard copied many paintings, chiefly by Roman Baroque artists, and, with his friend the French painter Hubert Robert, made numerous sketches of the Roman countryside. 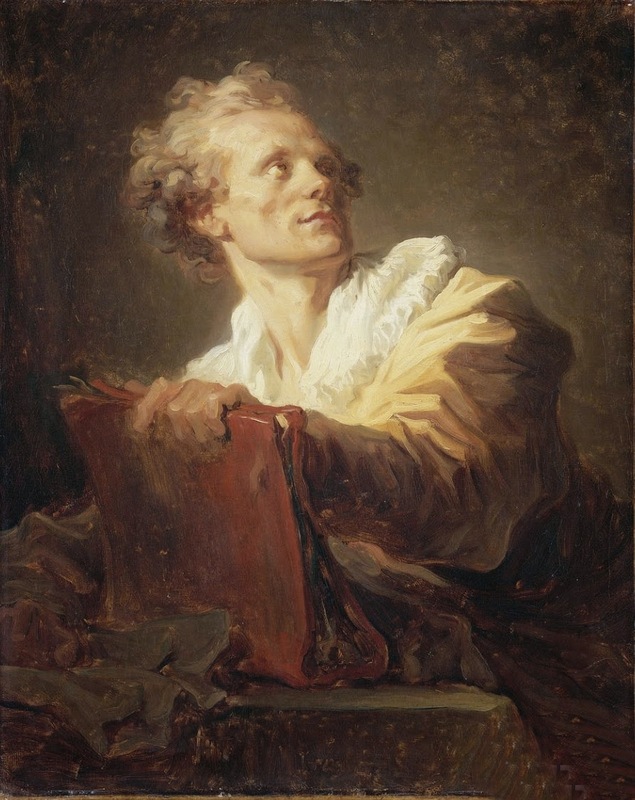 When his scholarship ended in July 1759, he was allowed to remain in residence until, in late November, he met a wealthy French amateur artist, Jean-Claude Richard, abbé de Saint-Non, who was to become one of his chief patrons. 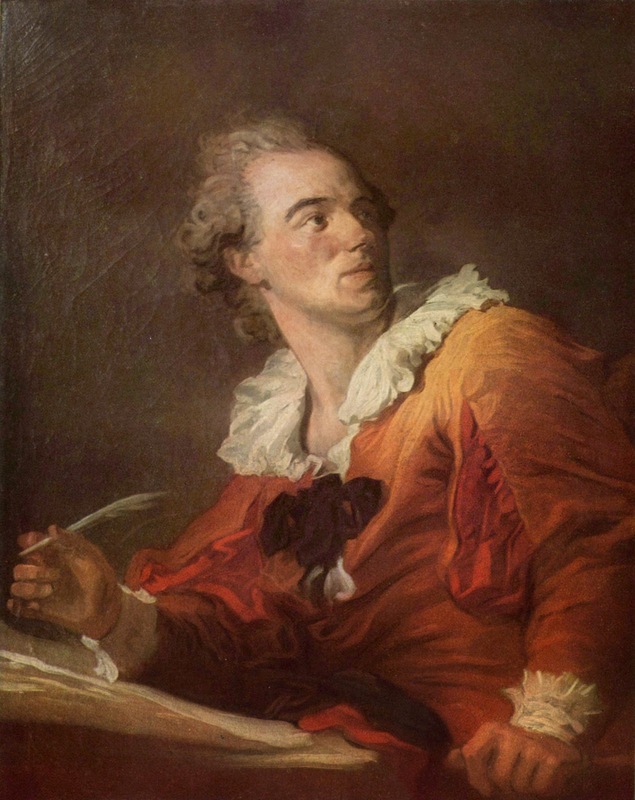 Early in 1760 Saint-Non took Fragonard and Robert on a prolonged tour of Italy, where the two artists studied Italian paintings and antiquities and made hundreds of sketches of local scenery. 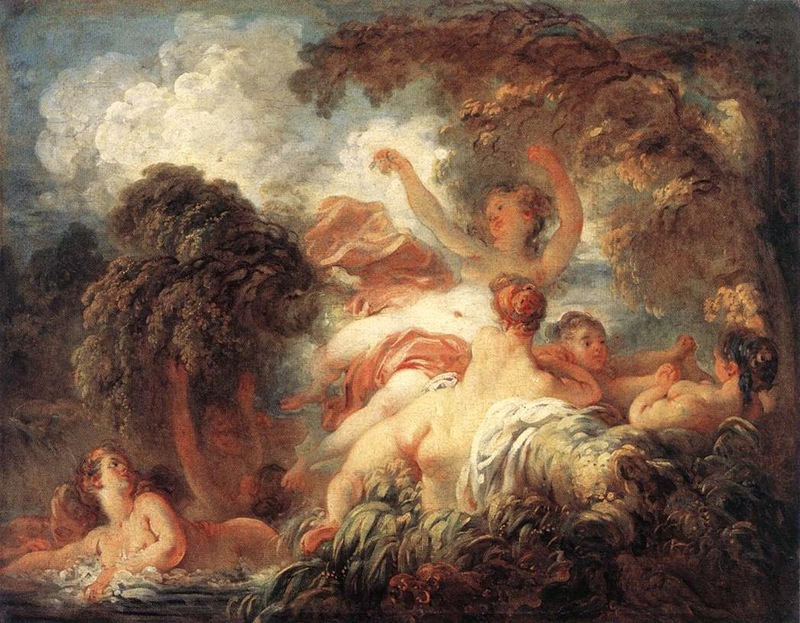 In 1761, after returning to Paris, Fragonard exhibited a few landscape paintings and the large Coresus and Callirhoë (1765) at the Salon, where it was purchased for King Louis XV. 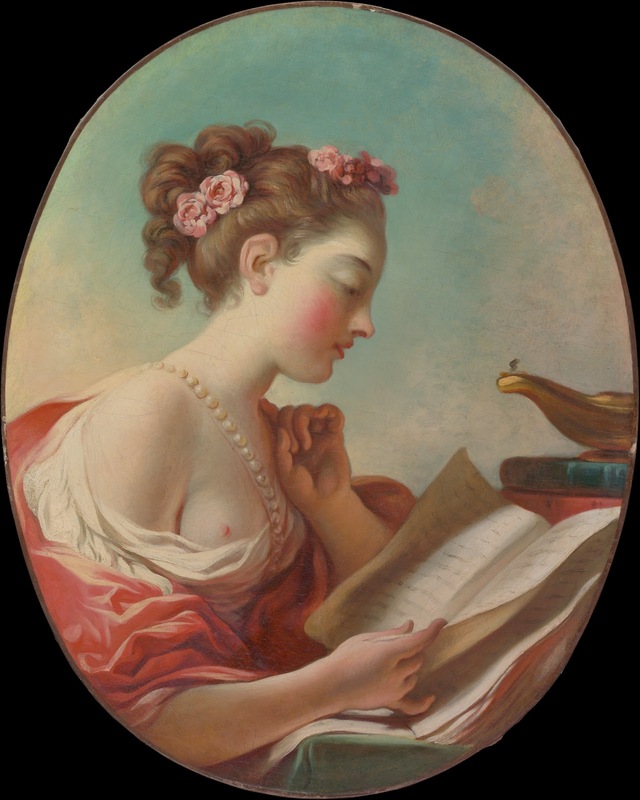 Consequently, the artist was commissioned to paint a pendant, or companion piece, granted a studio in the Louvre Palace, and accepted as an Academician. 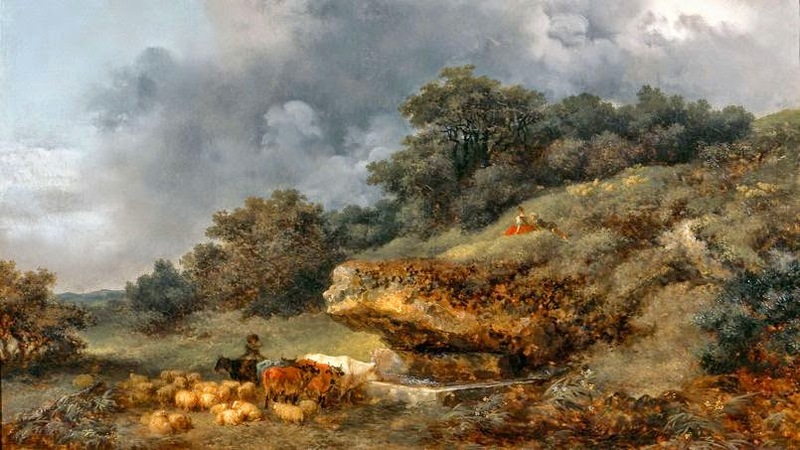 Nevertheless, after 1767 he almost ceased to exhibit at the salons, concentrating on landscapes, often in the manner of the 17th-century Dutch painter Jacob van Ruisdael (Return of the Herd, 1766); portraits; and decorative, sensuous outdoor party scenes, such as The Swing, in the style of Boucher but more fluently painted. 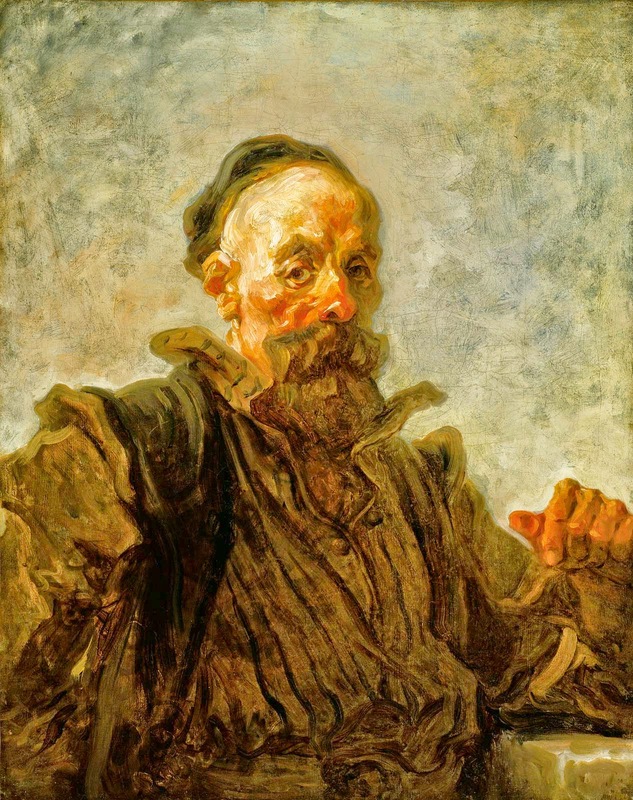 His admiration for Rembrandt, Peter Paul Rubens, Frans Hals, and a Venetian contemporary, Giovanni Battista Tiepolo, emerges in a large series of loosely and vigorously executed heads of old men, painted probably between 1760-1770 (Head of an Old Man, 1768/70), followed by a series of portraits (c. 1765-72) in a similar style and in which the sitters were real persons, but their fantastic costumes were emphasized rather than their facial expressions. 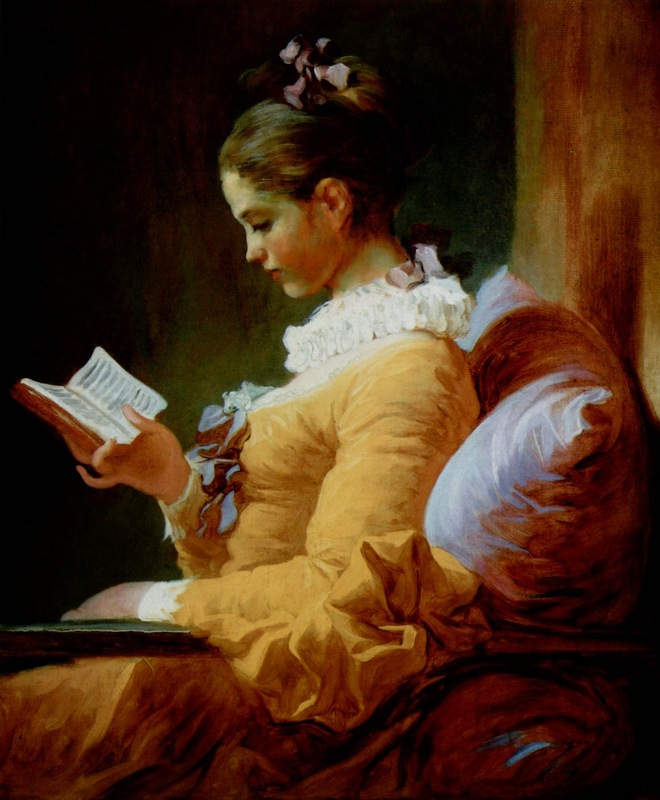 In 1769 Fragonard married Marie-Anne Gérard from Grasse and shortly afterward received the accolade of fashion, when in 1770 he was commissioned by Mme du Barry to decorate her newly built Pavillon de Louveciennes, with four large paintings (Progress of Love, 1771-73), and in 1772 he received a somewhat similar commission from the notorious actress Madeleine Guimard. 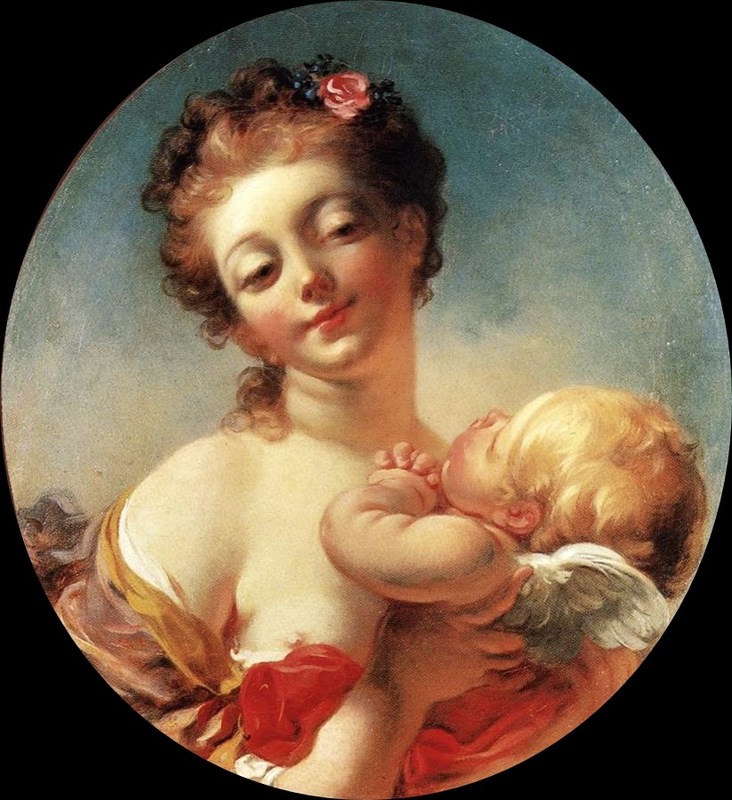 Neither was a success, the Louveciennes paintings probably being rejected as too Rococo for a totally Neoclassical setting. 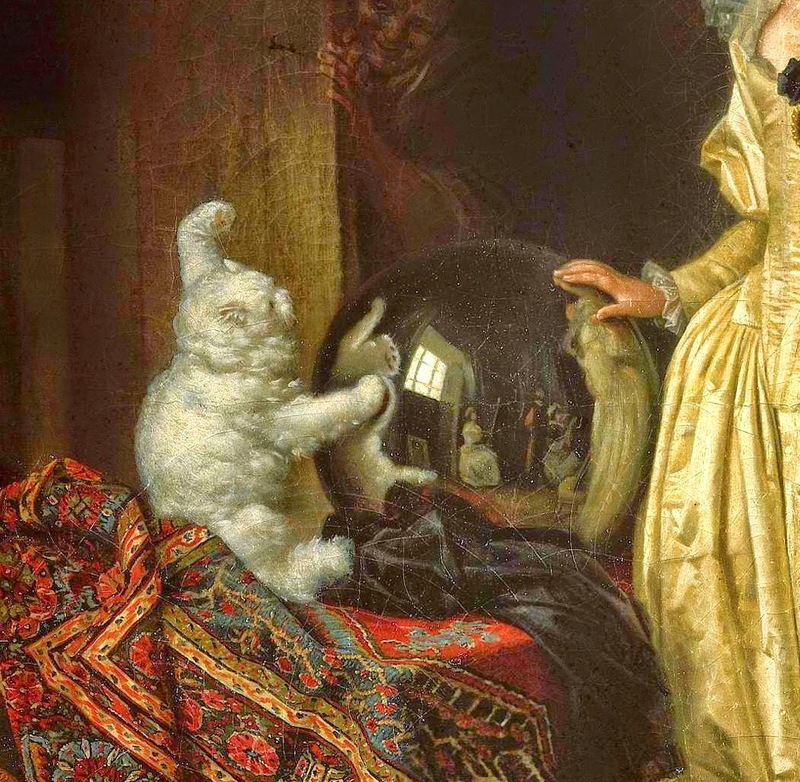 A journey to the Low Countries perhaps in 1772-73 increased his admiration for Rembrandt and Hals and was reflected in his later portraits. 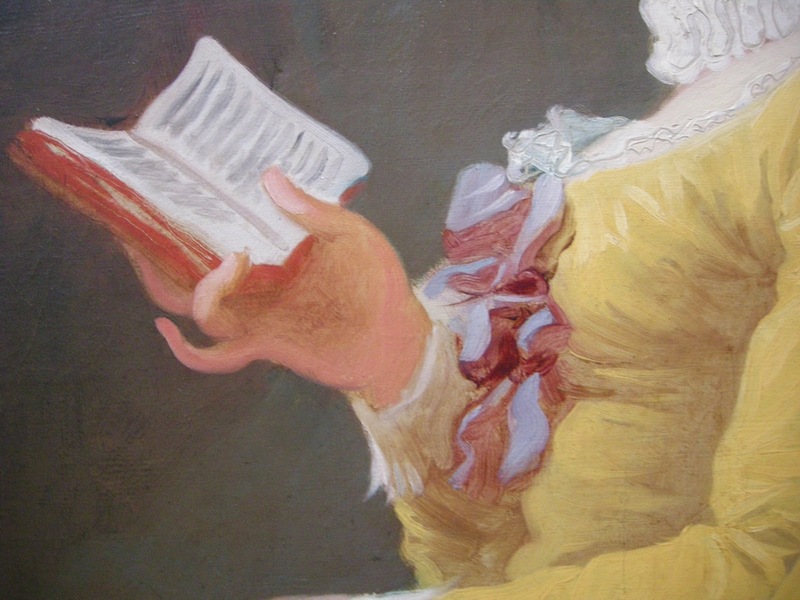 A second visit to Italy followed in 1773-74. 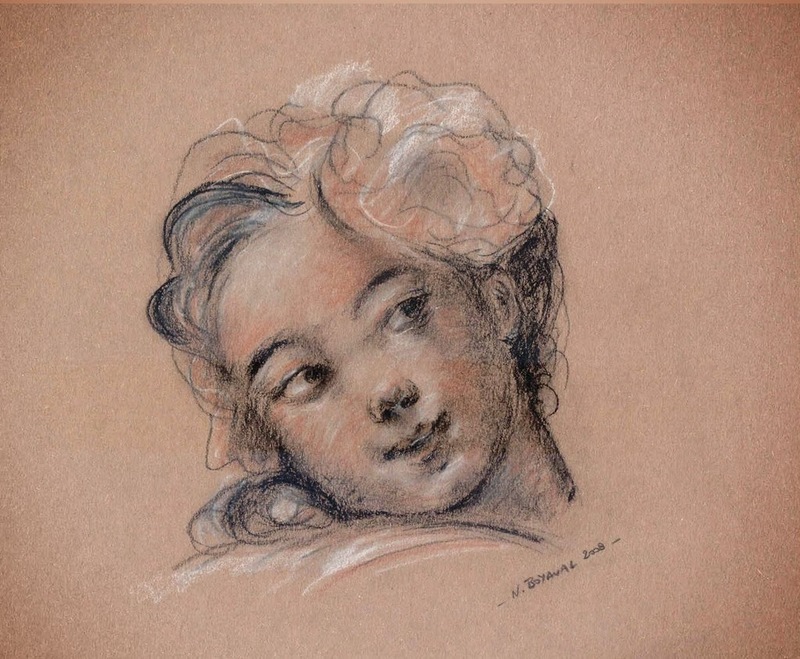 As before, he concentrated on drawing picturesque Italian landscape subjects rather than on painting. The return journey was taken through Vienna, Prague, and Germany. 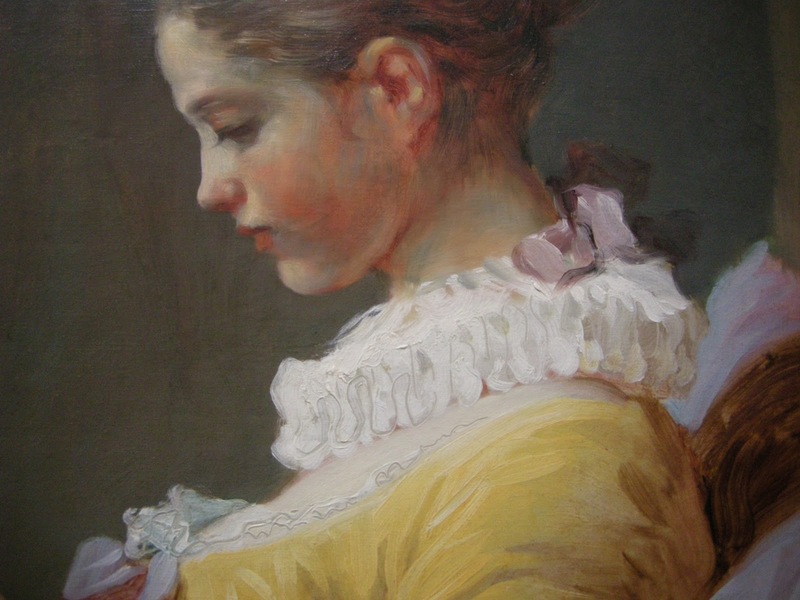 On his return to Paris, the family was joined by his wife’s 14-year-old sister, Marguerite, with whom Fragonard fell passionately in love. 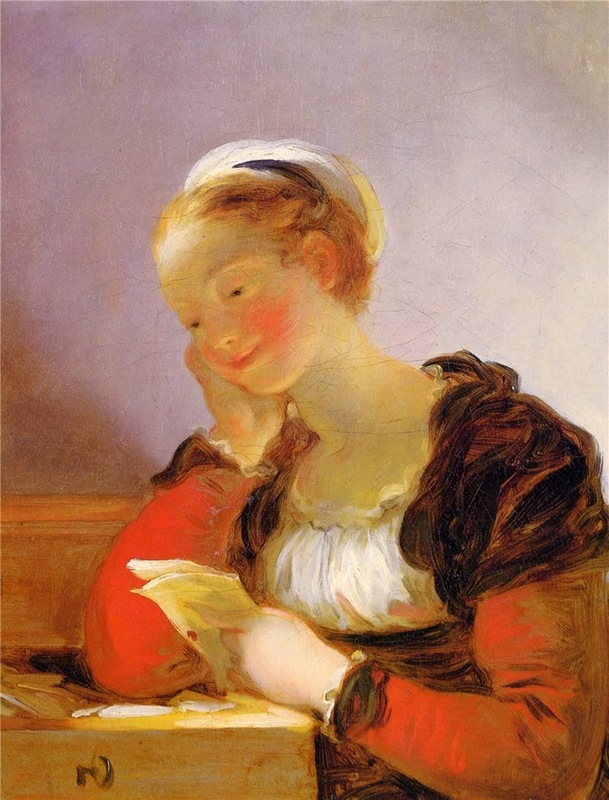 Consequently, he turned his interests toward a new type of subject matter: domestic scenes inspired by Jean-Jacques Rousseau’s moral philosophy or romantic novels (The Happy Family, c. 1775) or scenes concerned with children’s upbringing, in which his son Évariste (born 1780) frequently figures (The Schoolmistress [“Now Say Please”], c. 1780). 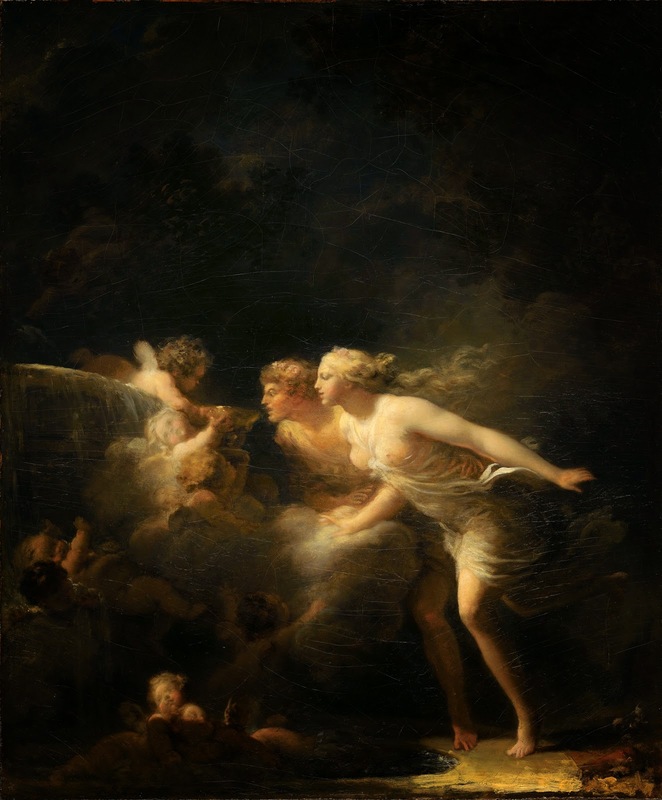 In the last years preceding the French Revolution, Fragonard turned finally to Neoclassical subject matter and developed a less fluent Neoclassical style of painting (The Fountain of Love, c. 1785), which becomes increasingly evident in his later works, particularly the genre scenes executed in collaboration with Marguerite Gérard (The Beloved Child, 1780-85). Fragonard’s art was too closely associated with the pre-Revolutionary period to make him acceptable during the Revolution, which also deprived him of private patrons. 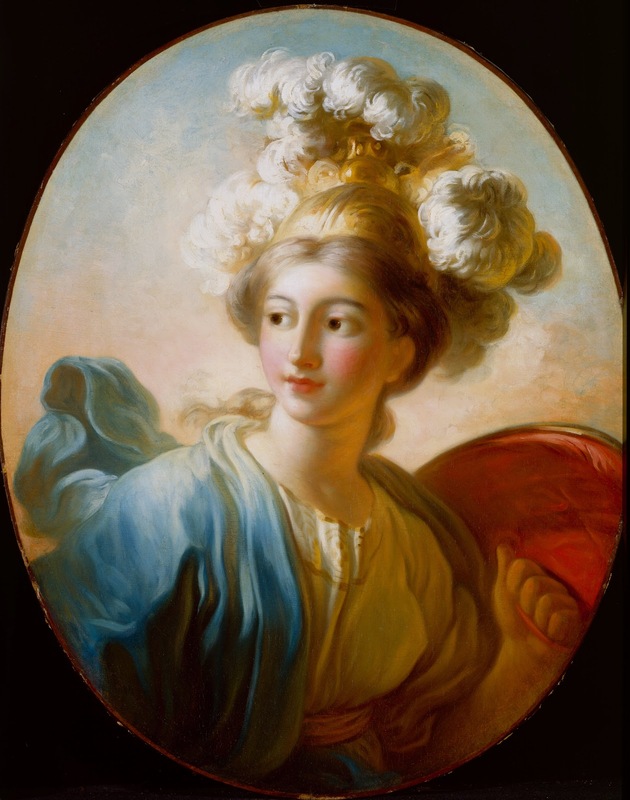 At first he retired to Grasse, but he returned to Paris in 1791, where the protection of the leading Neoclassical painter Jacques-Louis David obtained for him a post with the Museum Commission, but he lost this position in 1797. He spent the rest of his life in obscurity, painting little. 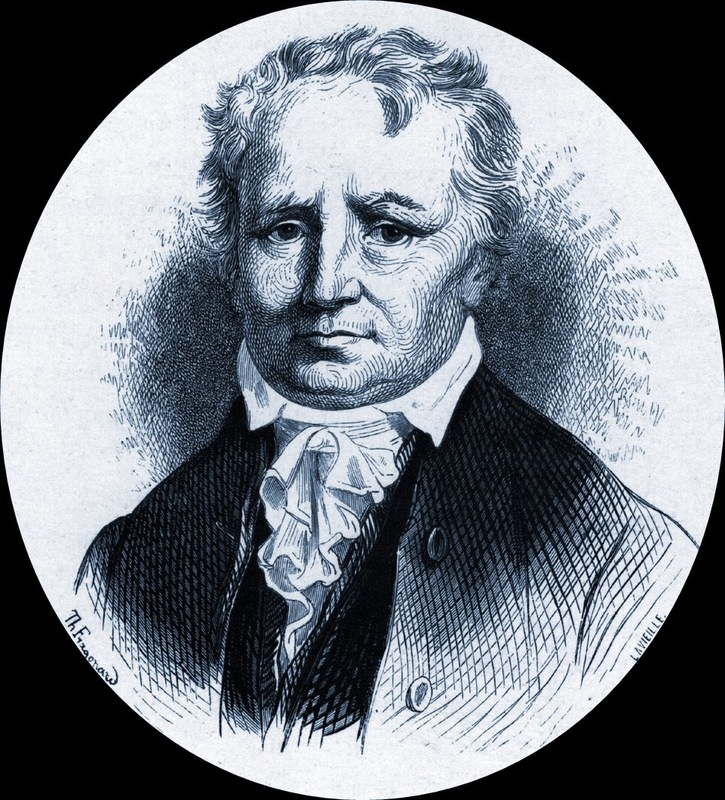 His death in 1806 passed almost unnoticed, and his work remained unfashionable until well after 1850. 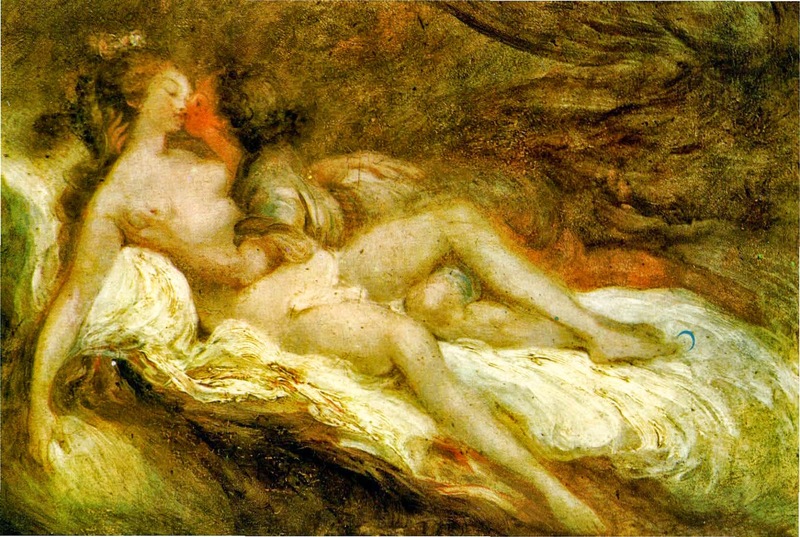 Fragonard has been bracketed with Watteau as one of the two great poetic painters of the 18th century in France. 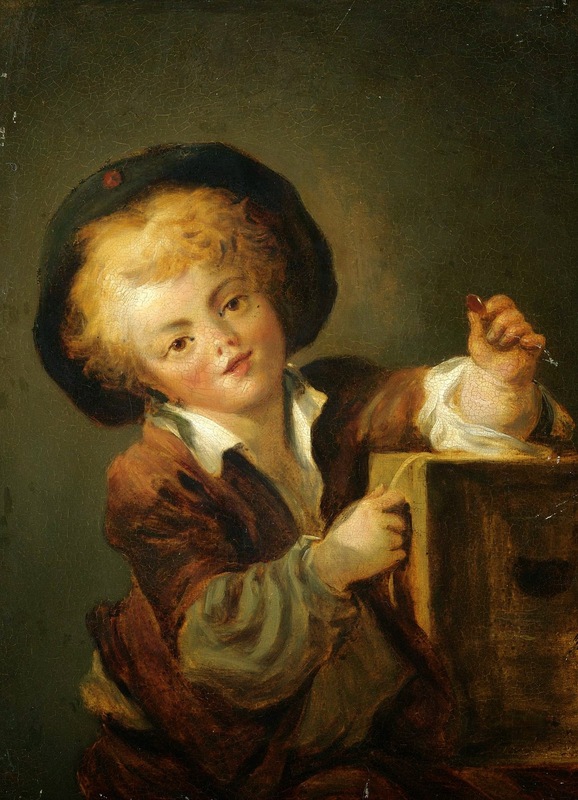 A prodigiously active artist, he produced more than 550 paintings, several thousand drawings (although many hundreds are known to be lost), and 35 etchings. 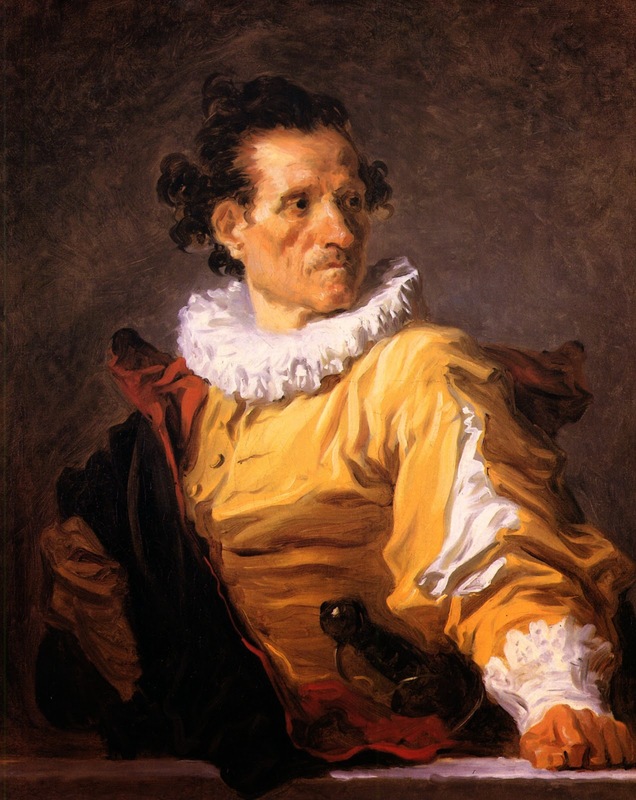 His style, based primarily on that of Rubens, was rapid, vigorous, and fluent, never tight or fussy like that of so many of his contemporaries. 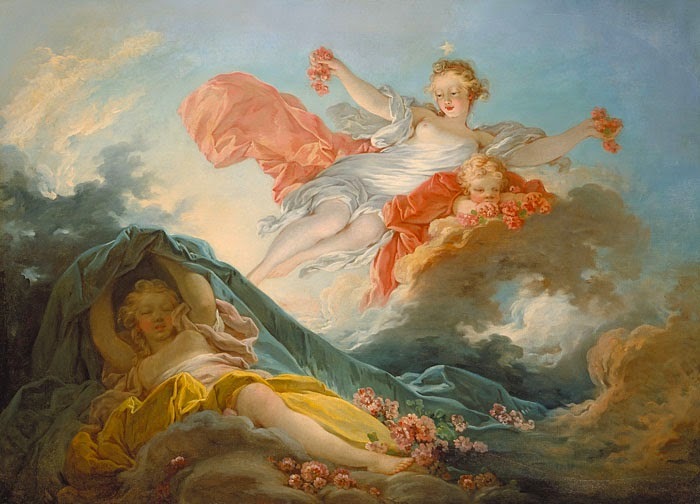 Although the greater part of his active life was passed during the Neoclassical period, he continued to paint in a Rococo idiom until shortly before the French Revolution. 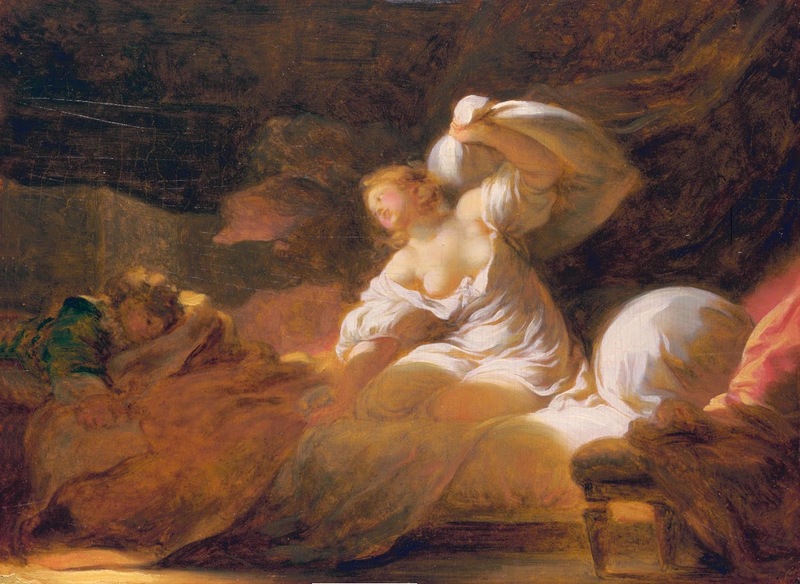 Only five paintings by Fragonard are dated, but the chronology of the rest can be fairly accurately established from other sources such as engravings and documents. |© Sir F.J.B. 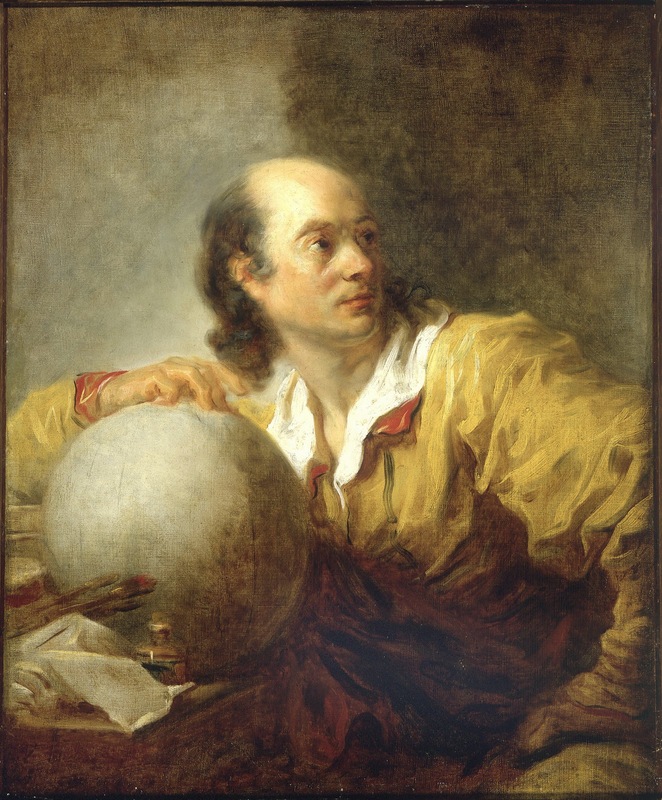 Watson, Encyclopædia Britannica, Inc.
Fragonard, Jean-Honoré - Pittore, nato a Grasse (Alpi Marittime) il 5 aprile 1732, morto a Parigi il 22 ottobre 1806. 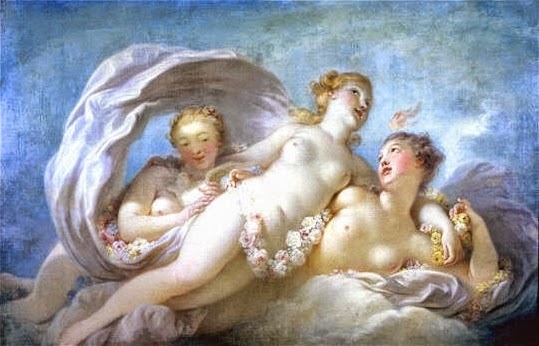 A Parigi (1746) fu dal 1746 allievo di Francois Boucher, poi dell'Accademia degli Élèves protégés, diretta da C. van Loo (1753-56). 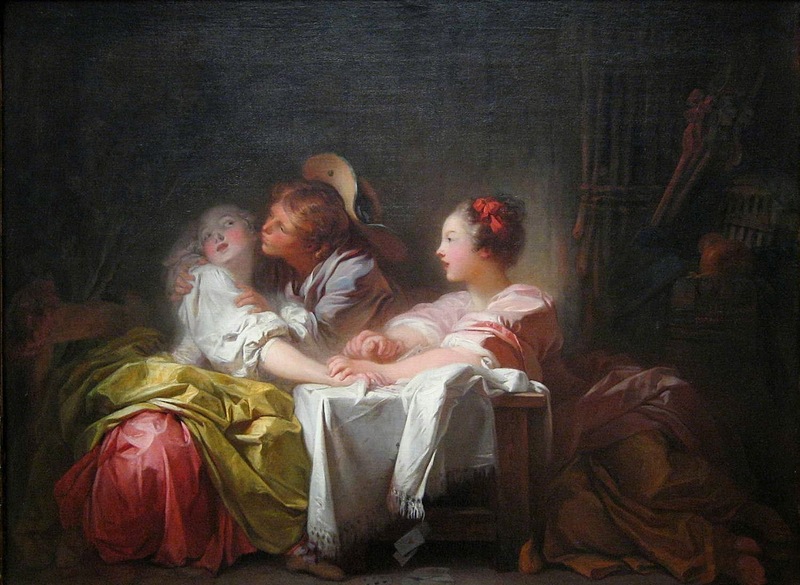 L'anno dopo, pensionato dall'Accademia di Francia, si recò a Roma, dove rimase sette anni (1756-63). A Roma si appassionò deì mirabili decoratori del sec. 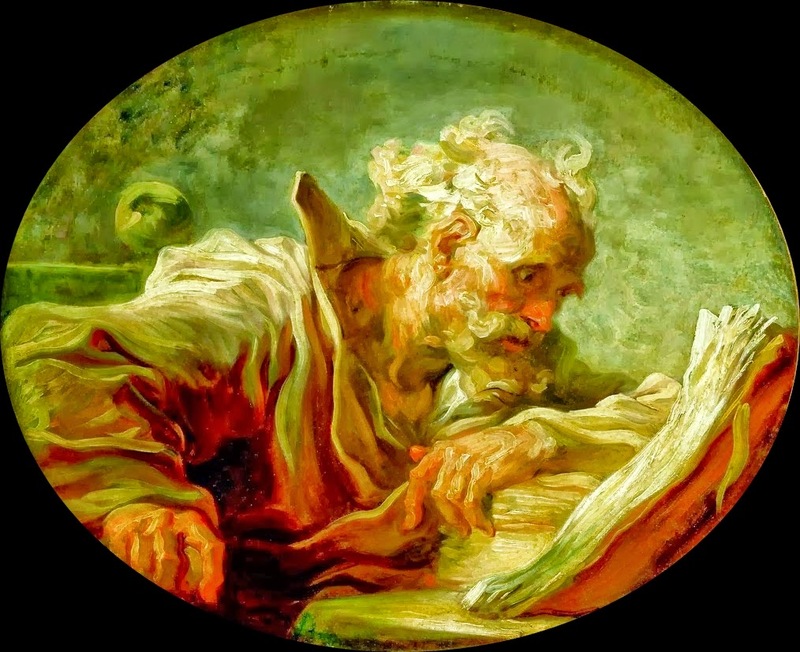 XVII, specie di Pietro da Cortona. 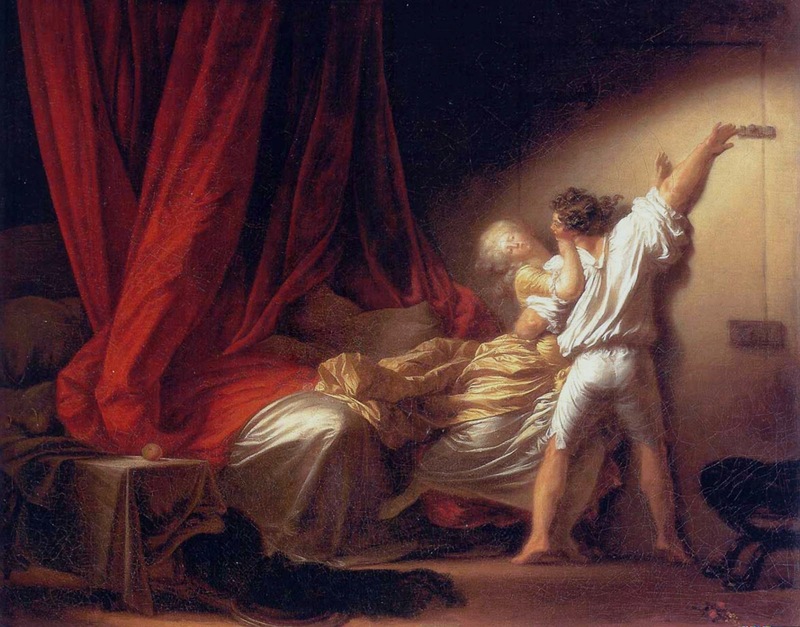 Strinse amicizia con Hubert Robert: è diffiìcile dire quale dei due influisse sull'altro. 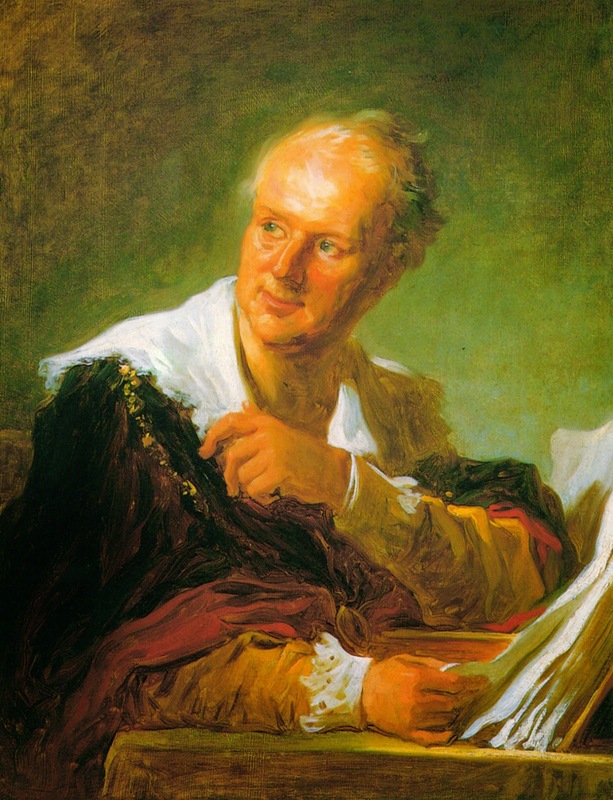 Nel 1760 i due passarono l'estate a Villa d'Este in Tivoli e da quel soggiorno vennero i celebri disegni (serie delle collezioni Groult e David-Weill e le sanguigne di Besançon) che fanno epoca nella storia del paesaggio, e fra l'Italia del Poussin e quella del Corot, presentano un'Italia tutta particolare, da scenario e da romanzo, con i suoi terrazzi, le sue ville, le sue fontane, i suoi cipressi: l'Italia del F. Nel 1761 i due giovani furono a Napoli; poi si spinsero fino a Parma e a Venezia. 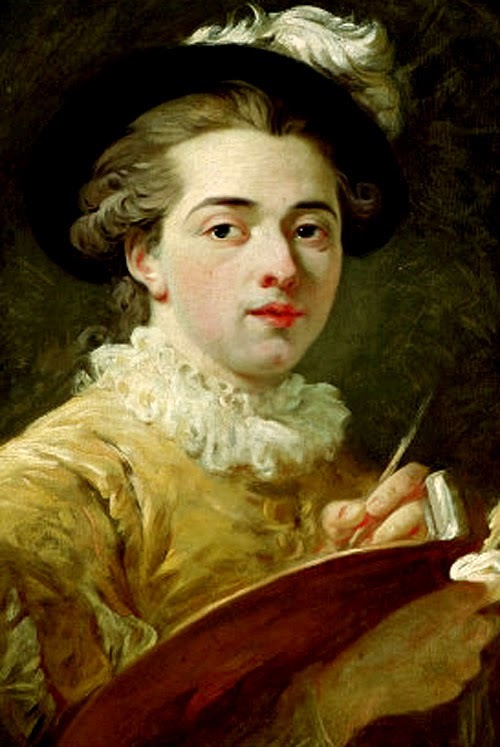 Frutto di questi viaggi furono due raccolte di studi, schizzi, impressioni, singolarissimo documento della formazione e del gusto dei due artisti. 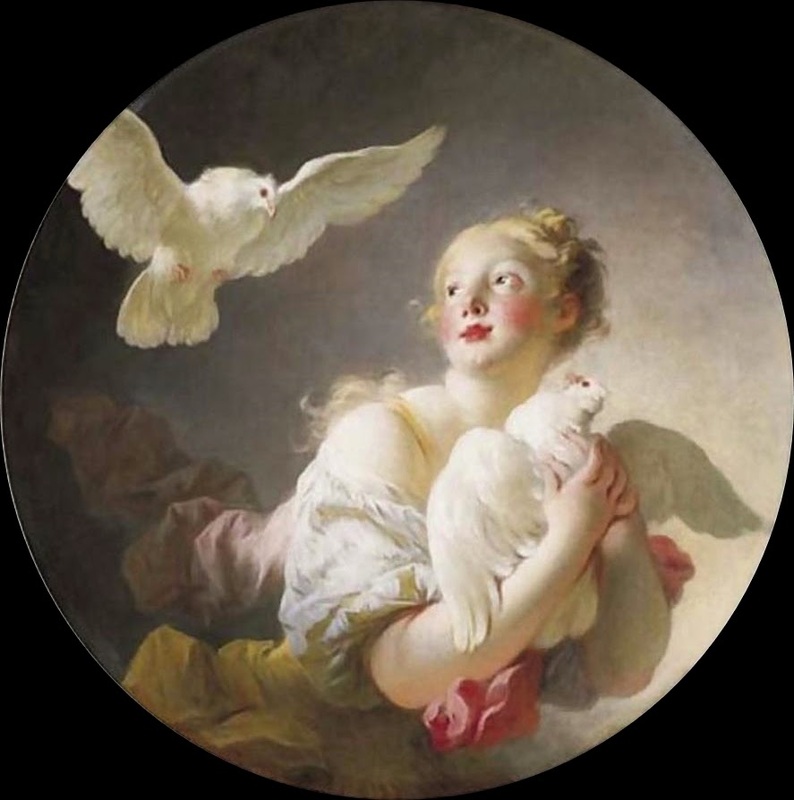 Ritornato a Parigi (1764) il F. intraprese il grande quadro che stabilì la sua fama - esposto nel Salon del 1765, Coressus e Callirrhoe (Louvre) - e il cui pregio consiste nel sentimento che l'anima. Amante più della propria indipendenza che degli onori, il F. preferiva dipingere per un pubblico di amatori e di gaudenti, a cui adattava i suoi quadretti, sempre animati da un brio travolgente e ai quali amava lasciare il fascino dell'improvvisazione. Riuscì uno dei pittori più varî del sec. 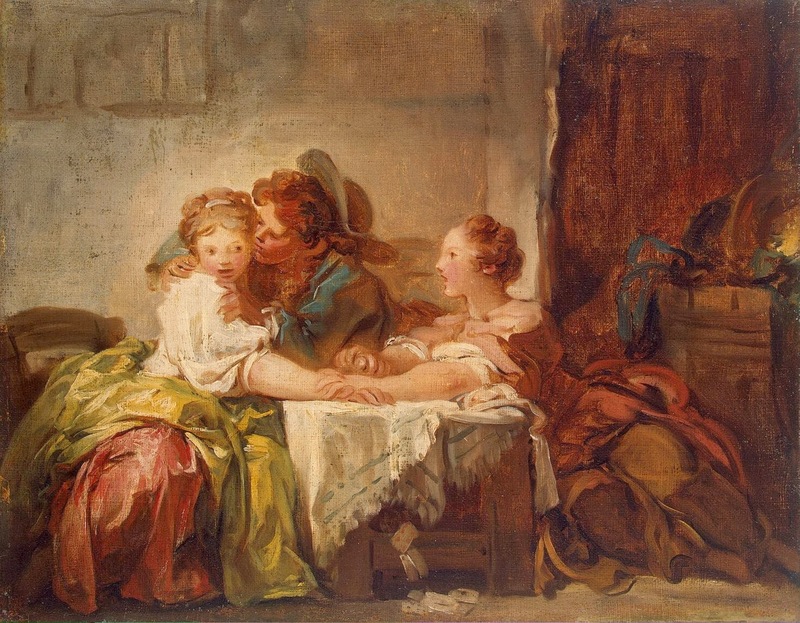 XVIII: la favola e la realtà più umile, la galanteria più arrischiata e l'intimità più borghese, Chardin e Tiepolo, Rembrandt e Greuze, la Grecia e l'Olanda, tutto si fonde nella sua arte leggiadra e incantevole. 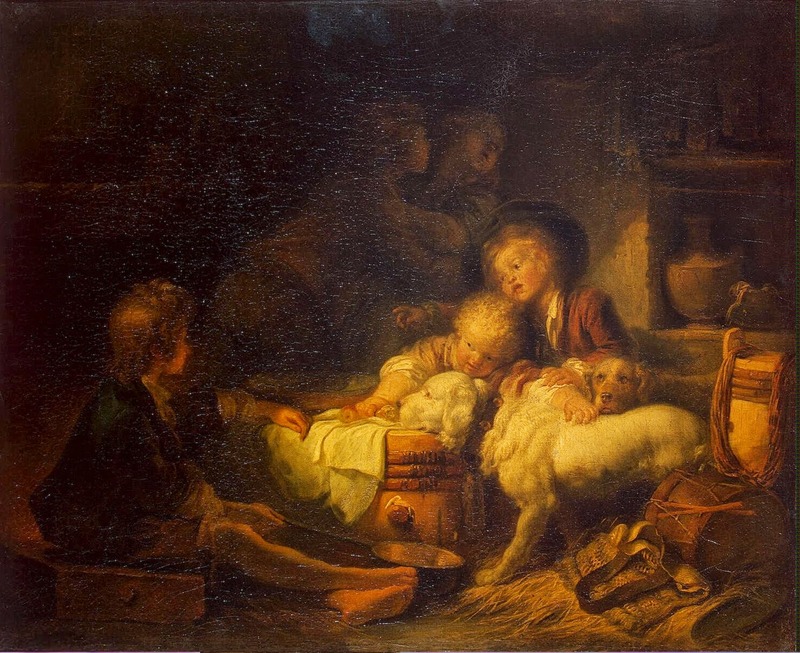 Dipinse i soggetti più equivoci e più licenziosi e quasi contemporaneamente Sacre Famiglie, scene domestiche o composizioni religiose. 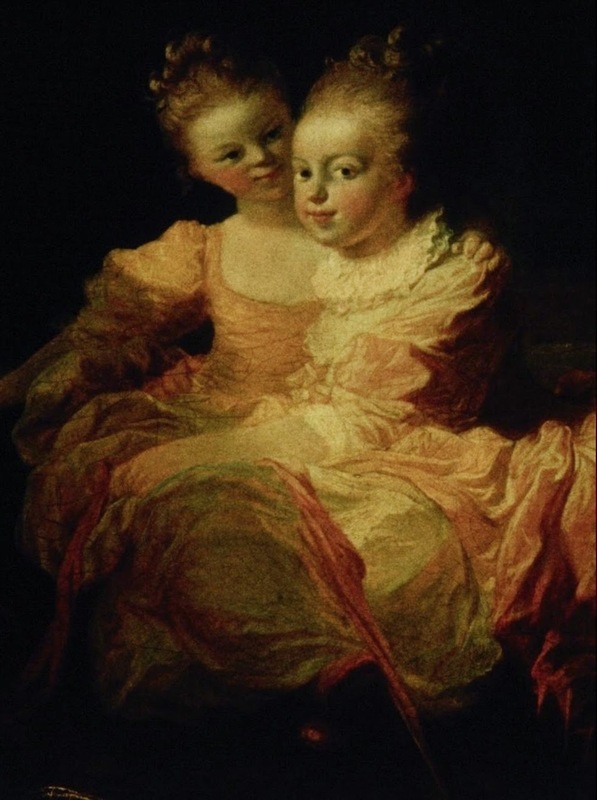 Ripreso dal bisogno di vita errabonda, nonostante avesse preso moglie, fu di nuovo in Italia (1773) e in molti altri paesi d'Europa. Non è possibile enumerare le sue opere disperse nelle maggiori collezioni d'Europa e di America. 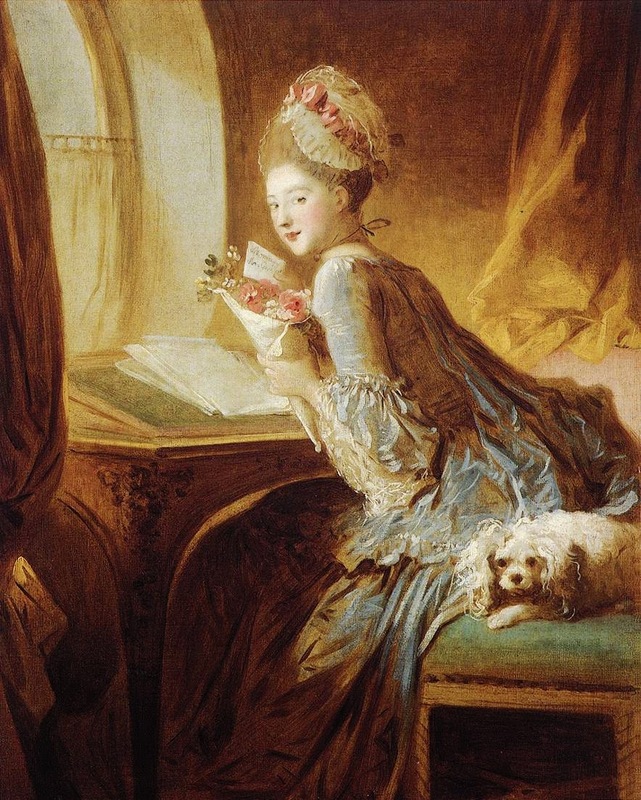 Raramente il F. sembra essersi posto a un lavoro continuo: unica eccezione, dopo il Coressus, sembra fosse la decorazione assunta nel 1770-72 del Padiglione di M. me du Barry a Louveciennes, presso Versailles (ora nella collezione Frick di New York, Metropolitan) una specie di poema che riassume in cinque quadri tutti i temi di una storia d'amore. 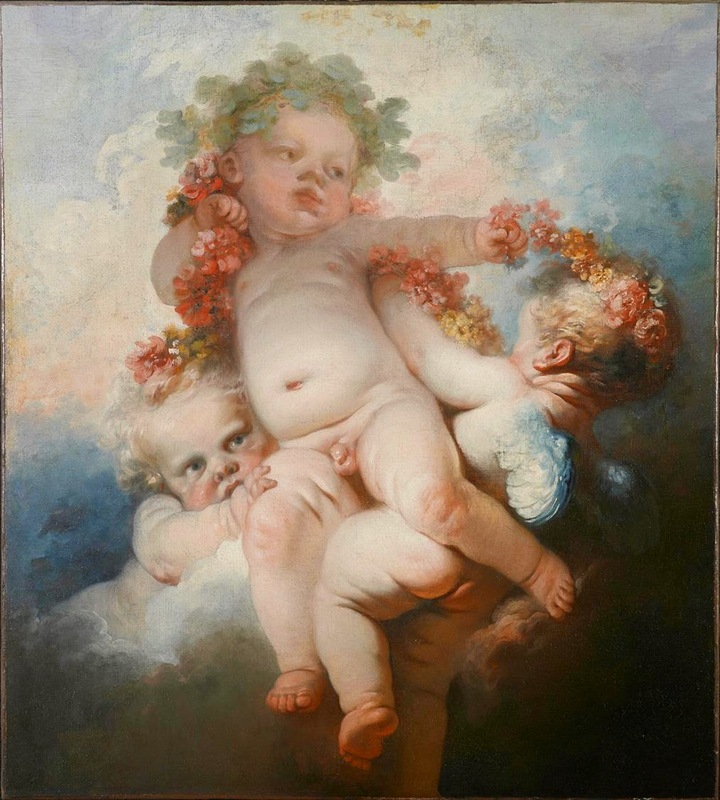 Degli altri suoi lavori decorativi è rimasto a posto solo il magnifico quadro, La fête de Saint-Cloud, appartenente alla Banca di Francia. 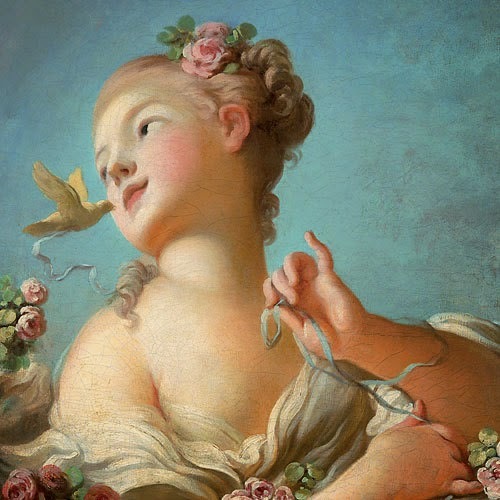 La poesia del F. sta nella sua rapidità, nella vivacità del tocco, che gli consente di dir tutto subito, senza insistere, così come egli lo sente. Il suo pennello disegna, costruisce e colorisce a un tempo. 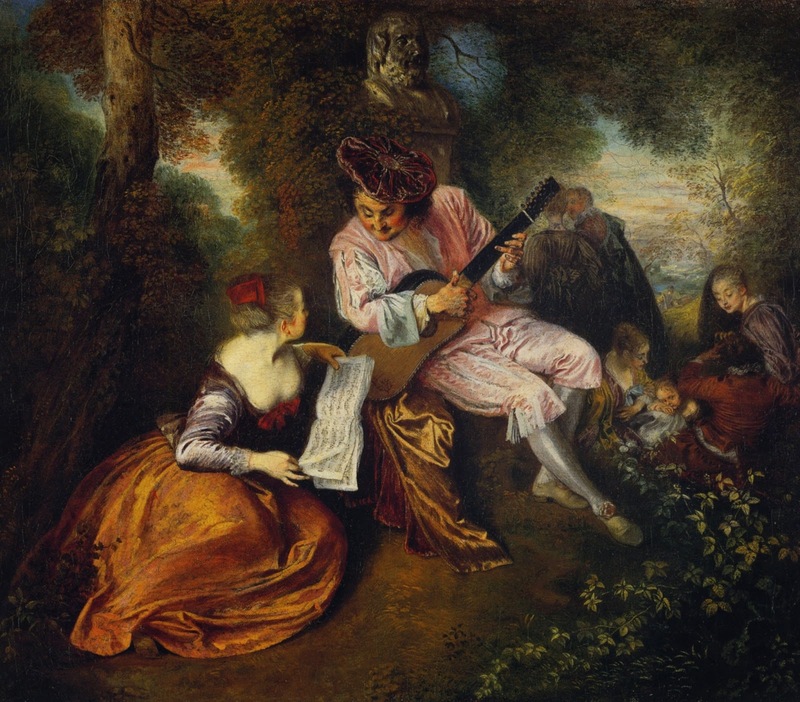 Il F. divenne così il maggior poeta del secolo, con il Watteau, il solo che sapesse trasformare il sensualismo un po' limitato e l'amore del piacere dominante al suo tempo in motivi di emozione durevole. 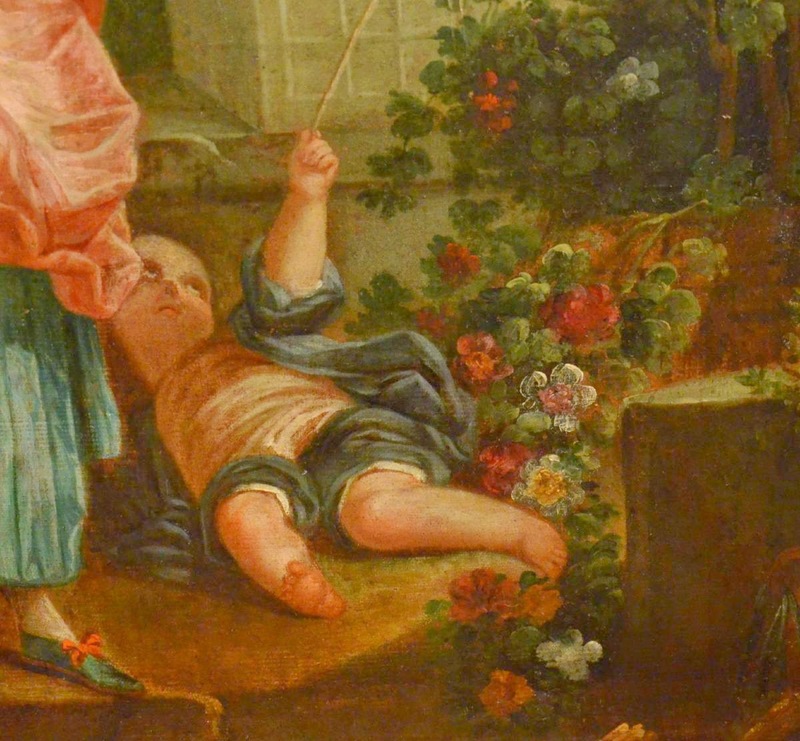 Lasciò perciò grandissimo segno del suo genio nei suoi disegni (raccolta del Louvre, dell'Albertina ecc.). E coi disegni fu un illustratore incomparabile (le Favole di La Fontaine, Orlando Furioso, Don Chisciotte e altri). 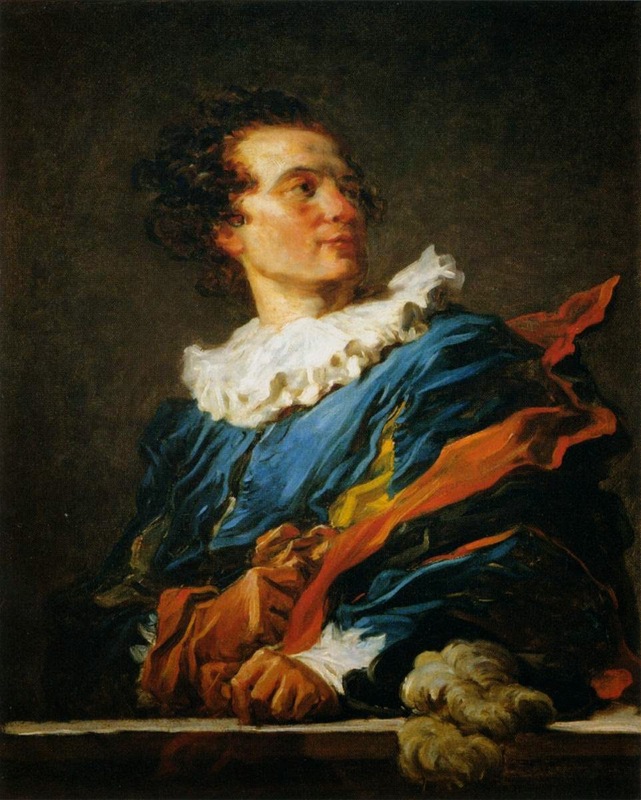 Nel 1790 l'artista si ritirò a Grasse per sfuggire alla Rivoluzione. 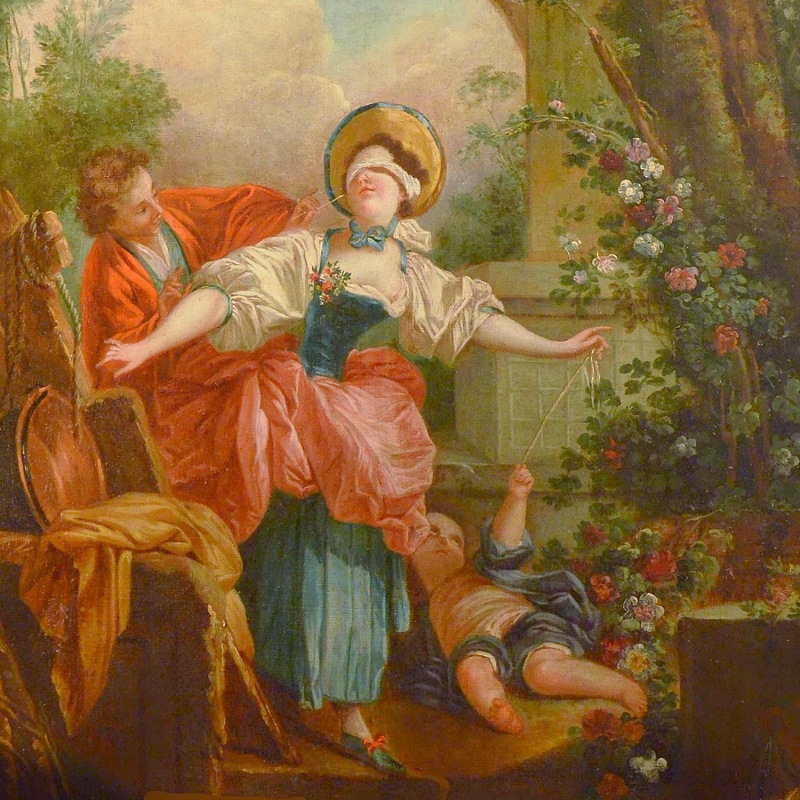 Ritornato a Parigi, fu nominato conservatore del Museo del Louvre, e membro del giurì delle arti. Ma egli era ormai passato di moda. 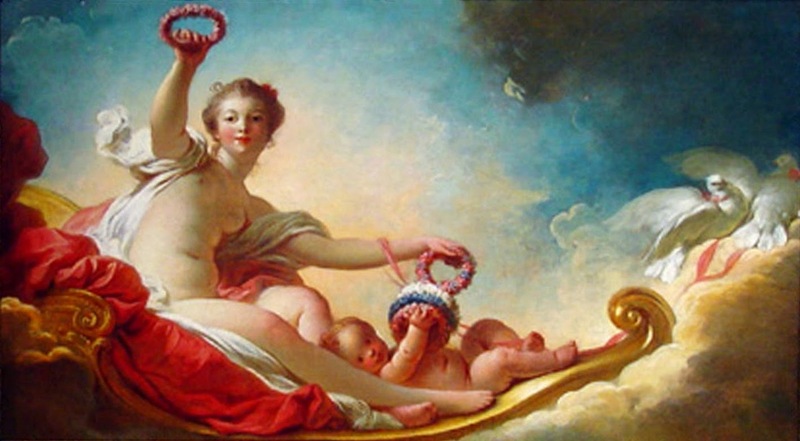 Solo da quarant'anni si è riconosciuto in lui uno dei più grandi maestri francesi e uno dei precursori dell'Impressionismo.